December sees the launch of Super Smash Bros. Ultimate. And never was a game better named. Here hundreds of characters will come together for the first Nintendo Switch outing. Whether you want to buy this landmark game digitally or in a physical bundle, you want to find the best price around. We’ve compiled the best selections for you, ensuring you can get access to yet another must own title from Nintendo. 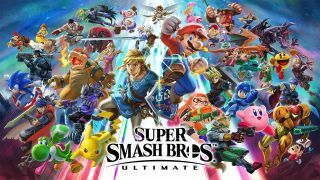 As recently reported here, Smash Bros Ultimate is looking to be the best way to experience the franchise. With a every single character coming back for the new fight, fans have already been going mad over every drop of news. But Nintendo isn’t holding back, bringing new characters King K.Rool from the Donkey Kong games, alongside Simon and Richter Belmont from the Castlevania series. Early opinions praise the idea of bringing together everyone as “a museum for its own franchise”. So whether you want to play online, be the best in the world or just rough up your mates in local multiplayer, we’ve got you covered for where to buy. And if you need one before it arrives, here are the best Nintendo Switch bundle deals out there (alternatively, stop by our cheap Nintendo game deals hub). For the ultimate experience, this Limited Edition version of the game comes with the standard release of Ultimate, but also features a Smash Ultimate branded Gamecube controller. And this is a genuine Gamecube controller, rather than a shell with Switch features implemented. This means you’ll need an adaptor, but this edition comes with that too. Perfect for recreating the best way to play the franchise. Buy it US – This edition is unavailable in the U.S. While the Limited Edition version is not available in the U.S. a version is available from Best Buy, which includes a steelbook case for the game and a Wireless Pro Controller with the Smash Bros logo emblazoned. If you want to play with the controller all the professionals tend to use and the controller that Smash was designed for, you’ll want this Gamecube controller. However, to connect it to your Switch, you’ll also need an adaptor which will set you back a bit more. Keep in mind you only need one adaptor to support up to four players using the Gamecube controller. Buy it US – Controller for $29.99 at Amazon. Amazon also sell the Adapter for $19.99. Buy it UK – Controller for £29.99 at Amazon. Amazon also sell the Adapter for £19.99.